Safety Aspects of Vacuum Processing | Management Plus, Inc. If you have a safety-related comment, picture or story please send it to me and it will be posted on this blog with credit. The vacuum environment used in vacuum coating poses no direct safety hazard unless you happen to be in the chamber when the vacuum is created. In the space program people have died when their space suits have failed in vacuum . The pressure differential that is established between the ambient and the vacuum can create safety hazards. If a glass enclosure, such as that of a glass bell jar chamber or the envelope of an ionization gauge, breaks then the pressure differential will cause an implosion of the glass shards. The flying glass can pose a safety hazard. Glass bell jars can easily break if heated non-uniformly such as having an electron beam hitting one area. If they are used, they should be surrounded by a wire enclosure (guard) to prevent the glass shards from escaping. The glass envelope of an ionization gauge should also be surrounded by a mess enclosure, more to prevent it from being accidentally broken than it being a safety hazard. When working around systems where an implosion may occur, safety glasses and/or face shield should be worn. Vacuum chambers are not designed for pressurization, and if backfilling from a high-pressure source, such as tank nitrogen, causes the pressure in the chamber to exceed the ambient atmospheric pressure, a vacuum seal may release violently causing injury or damage. Capturing the seal with clamps or bolts and having a pressure relief valve on the regulator and/or chamber can avoid this hazard. Chamber doors should have stops that prevent them from opening more than a centimeter or so without removing the stop, this prevents them from flying open unexpectedly. The vacuum pumping system used to generate the vacuum poses the same safety hazards as those commonly encountered in any electrical and mechanical equipment. Moving parts, such as belts and pulleys, should be shielded so that hands and clothing will not get caught (ties and scarves are particularity bad). High-voltage leads should be shielded. Interlocks should be used to prevent the high voltage from being turned on unless there is a vacuum in the chamber. If an interlock is overridden for maintenance reasons there should be a flashing red light for everyone to see (see upcoming Blog on “Lock-out/Tag-out – LOTO”). This helps avoid what I call “knob twiddlers” from turning the power on. Rings on fingers may cause electrical shorts or be mashed by mechanical action. I recommend use of a silicone band if you must wear a wedding band to keep marital bliss. Oxygen is used for reactive plasma cleaning and the reactive deposition of oxide compounds. Compressing pure oxygen in a mechanical pump that uses hydrocarbon oil can cause a diesel-type explosion that can blow the pump apart. Using an oxygen-nitrogen mixture, such as pure air, that is not explosive, can eliminate this problem. The air may be injected through the ballast valve on the mechanical pump. More chemically stable fluids, such as silicone oil or perfluorinated polyether (PFPE) such as Fomblin™, may be used in the mechanical pump, but generally they are not good lubricants and maintenance may be a problem. Pumping pure oxygen in a cryopump followed by pumping of hydrogen or a hydrocarbon, may cause an explosion in the cryopump on regeneration if there is an ignition source. If using a hydrogen plasma, forming gas (<5.7% H2by volume in N2) may be a safer material. Plasmas, along with high voltages, can pose a safety problem if a metal vacuum chamber is not adequately grounded. A plasma in contact with a surface at a high negative voltage can float to a high negative potential with respect to ground. If an electrically floating surface, such as a metal vacuum chamber isolated from ground by a rubber-sealing gasket, is then in contact with the plasma it may attain a high voltage with respect to ground. This can present a shock hazard. High voltages in contact with the plasma can come from such diverse sources as bias voltages on substrates or ionization gauges that are left on, particularly in the degas mode, when a plasma is established. All metal surfaces in plasma systems that are not being used as high voltage electrodes should be well grounded to prevent such floating potentials. In thermal evaporation the material being evaporated is at a high temperature and the radiation through viewports may harm the eyes of observers, particularly those wearing contact lenses. An optical filter, which transmits the visible and reflects the infrared, may be used to prevent the radiation from reaching the observer. 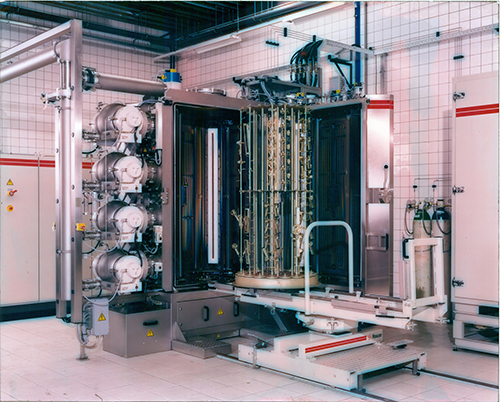 High-pressure gas sources are often used in vacuum processing. High-pressure gas cylinders can pose a major safety hazard if they fall and the tank-valve or regulator is knocked off. They then can become a jet-propelled missile. Gas cylinders should be transported with the correct equipment, stored with a protective cap over the tank valve and tied-down when not being transported, particularly when the pressure regulator is on the tank valve. Plumbing between the tank and the point-of-use should have a flow restrictor and a pressure relief valve to prevent over-pressurizing the gas line and chamber. When using toxic gases such as arsine or flammable gases such as silane, the distribution system should be of double-walled tubing. This allows the outer jacket to carry escaping gases to a volume, such as the cylinder cabinet, where they can be detected as shown in Figure 1. Gas plumbing should be helium leak-checked after installation. Detectors and alarms are available for toxic and flammable gases. The exhaust system for the storage cabinet should not exhaust near the air intake for another area. When changing gas cylinders or investigating a gas leak in a toxic gas distribution system, Self-Contained Breathing Apparatus (SCBA) equipment should be worn. Gas suppliers provide handling instructions and Material Safety Data Sheets (MSDSs) for gaseous materials (see references). 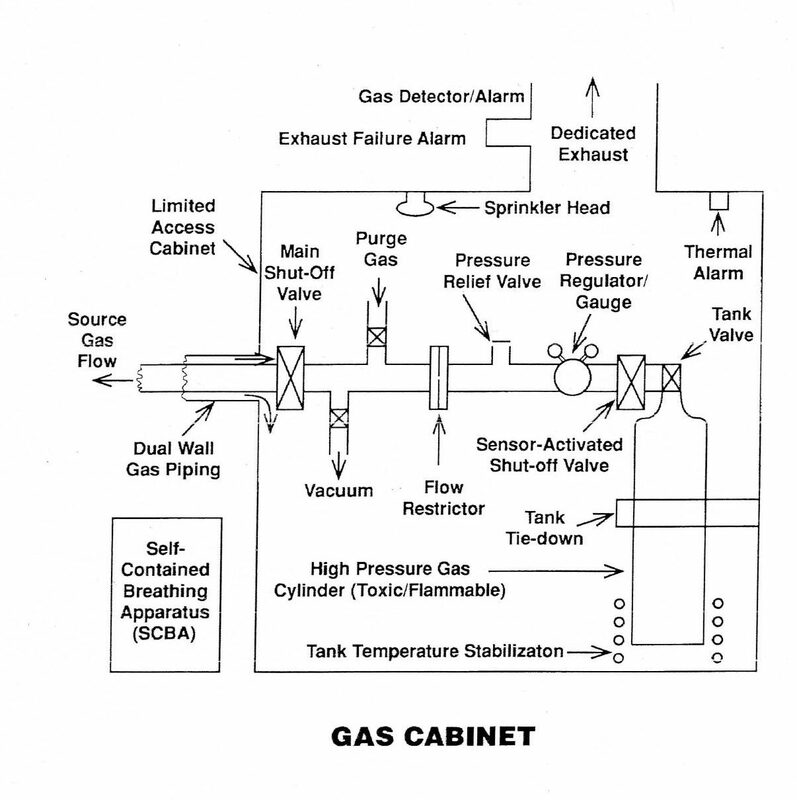 Figure 1: A cabinet for containing toxic, flammable, explosive, carcinogenic, or mutagenic gases and vapors. Changing gas cylinders can introduce contamination into the gas lines. If this is a concern, a valve arrangement, such as shown in the figure, may be used to allow evacuation and purging of the gas distribution line prior to opening the cylinder valve. Gas cylinders should never be allowed to be emptied to ambient pressure because, when opened later, they may draw in air and water vapor if the new ambient pressure is higher than the pressure in the tank. Always leave 10 to 15 psig pressure in the tank. Regulator valves for use with oxidizing gases should not be lubricated with hydrocarbon lubricants. Vacuum pumps are often used to pump flammable, corrosive, or toxic gases. These gases may accumulate in the pump oils and present a maintenance hazard. For example, pumping of chlorine-containing gases with a hydrocarbon-oil-containing vacuum pump in the presence of oxygen or water vapor can produce phosgene (COCl2), a toxic gas. Pumping fluorine-containing gases with pumps containing hydrocarbon oil can lead to the formation of hydrofluoric acid (HF), which can accumulate in the oil. Often flammable, corrosive, or toxic gases are removed from the pump exhaust by burning and/or by solution in water. For example: in the exhaust system, silane (SiH4) can be burned to form nontoxic SiO2. Chlorine-containing gases can be dissolved in water either by bubbling through water or in a water spray tower. The exhaust system of such systems should be monitored and alarmed for flammable or toxic gases. 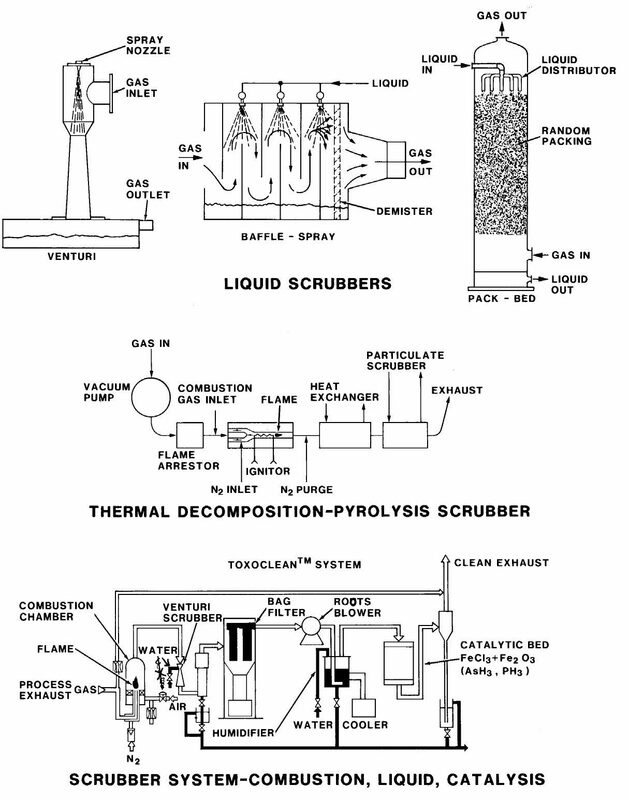 Figure 2 shows some exhaust “scrubber” arrangements. Gas mass flow meters (MFM) generally are designed to only withstand several hundred psi inlet pressure. Higher pressures can result in the violent failure of the meter. Because the gas sources for PVD processing are often from high-pressure gas cylinders, it is important that the full cylinder pressure never be applied to the flow meter. This can be avoided by using a pressure regulator on the gas cylinder and including an appropriate flow restrictor and pressure relief valve in the gas distribution line. In case the regulator diaphragm fails and full cylinder pressure enters the line, the flow restrictor causes the line pressure to increase to the point that the pressure relief valve is actuated before pressure in the downstream line exceeds the design pressure of the mass flow meter. The MFM should be shielded from personnel just in case. In high-rate vaporization of oxygen-active materials, such as titanium and zirconium, in an inert plasma environment, vapor phase nucleated particles can form “soot” that deposits on the walls of the chamber. These fine particles form a very thin passive layer when exposed to air. When disturbed the particulate layer may catch fire and spread over the whole surface. Such deposits should be wet-cleaned in order to prevent a fire. Concern has been expressed about forming toxic cyanide (CN) gas when combining nitrogen and a hydrocarbon vapor, such as acetylene (C2H2), in a plasma when depositing a carbonitride film. To my knowledge, no harmful level of cyanide has ever been detected in the exhaust of such a plasma system. Cleaning vacuum systems, fixtures and substrate holders generally involves chemicals and the basic aspects of chemical safety (eye protection, skin protection, etc.) and respiratory safety (filter masks) should be observed. Removing particulates of film deposit should be done by wet chemical methods to avoid forming “dust” of the material. When using dry abrasive cleaning, such as grit blasting, appropriate eye and respiratory protection should be worn and the work performed in a well-ventilated area. Silica grit (silica sand) should not be used for grit blasting because of respiratory concerns (silicosis) with the dust – use alumina grit. © Donald Mattox – Not to be reproduced without permission. This entry was posted in Safety Aspects - Vacuum Processing on September 4, 2018 by miriam_hill.